Imagine, if you can, that workers at CERN have begun talking to dead people, thanks to the LHC. This is the plot of Franklin Clermont’s novel The Voices at CERN. Shannon Fields, the fictional CERN senior press relations coordinator, is tasked with speaking to the concerned wife of one of the technicians. Shannon’s superiors reason that she is qualified for this task because her job entails explaining “each new discovery to the waiting news organizations that felt compelled to deliver news in 30 second sound bites only and language pegged at an eighth grade reading level or lower”  as well as talking to the general public about black hole fears and “that destroy-the-world stuff” . 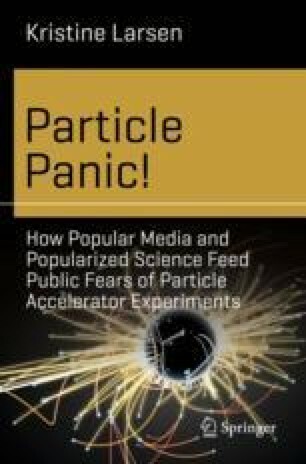 Shannon is understandably concerned about the ramifications to their public image (especially on safety issues) if the employees’ claims becomes public, imagining the resulting “lurid American tabloid headlines: ‘CERN: I Hear Dead People’” . While this example is clearly outlandish, the fictional headline is an excellent parody of reality. However, studies suggest that it is not the tabloids that Shannon and her real-world counterpart have to be concerned about, but rather the Internet, especially in the United States . The fact-checking website Snopes.com has had to debunk several curious Internet claims about CERN, perhaps the most bizarre being a video purporting to show a ritual human sacrifice conducted on the grounds of the facility . In reality it was a prank conducted without the knowledge or permission of CERN and those responsible were held accountable . However, the damage has already been done, as the video is still easily found online.